2 Welcome! Ladies and gentlemen, welcome to my school! My ‚crazy’ class Ladies and gentlemen, welcome to my school! I’m Sandra and I’m 12. I’m an ordinary girl from class VI B. I’m going to show You my teachers and my community. 3 My community In my school there are so many children (about 200). Some are lovely and cool, some are rascals but still lovely. I really love my school friends, but sometimes I want to change them. I love when we go on the trips, to the cinemas or other places. 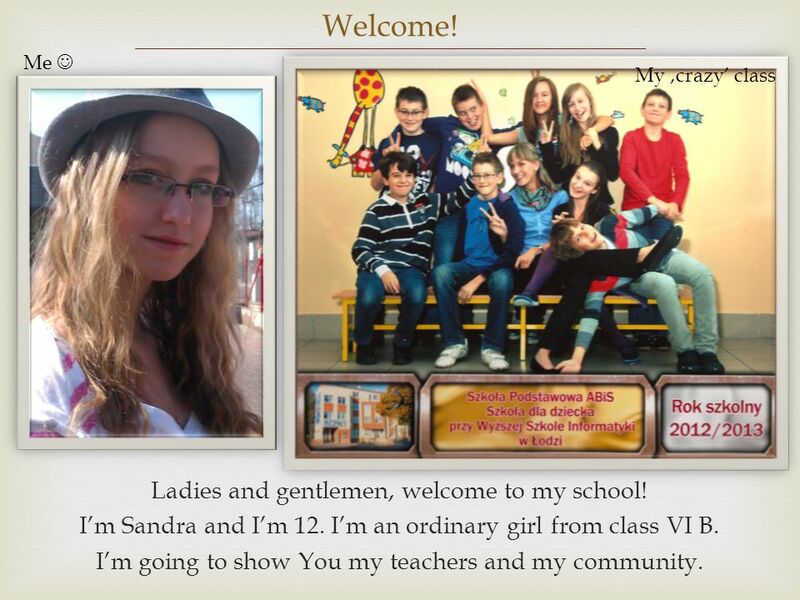 I’m really happy that I am in this school, I would never change it! In free time children my age like playing on consoles or in a yard with friends. I also really like going shopping with my friends. 5 Mrs Anna is our headmistress. Mrs Anna Sowińska Mrs Anna is our headmistress. She is so lovely and I’m really thankful to her for the school she intvented. MrsEla is my English teacher, also my educator. She is a great teacher and a lovely person. 7 Ms Agata Juliańska Ms Agatka is my teacher from grades 2-3. She is like my second mother, really sweet and lovely. 8 Ms Katarzyna Banach Ms Kasia is my Polish teacher, also the educator of class V. She is the greatest Polish teacher in the world. Mrs Bogusia is my Maths teacher, also educator of class VI A. She is very helpful and lovely. Mrs Joasia is my Science teacher. She is really cool. 11 Mrs Paulina is my French teacher. She is lovely and always happy. Mrs Paulina Oczkowska Mrs Paulina is my French teacher. She is lovely and always happy. 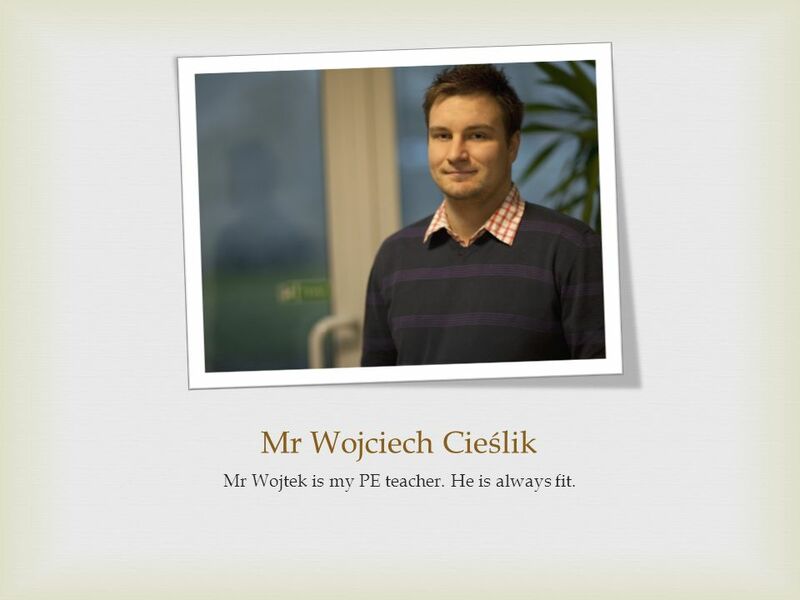 12 Mr Wojtek is my PE teacher. He is always fit. Mr Wojciech Cieślik Mr Wojtek is my PE teacher. He is always fit. Mrs Marysia is my Music, Art, IT and Techniques teacher. She has got an artist ic soul. 14 Mr Maciej Chocholski Mr.Maciek is my History teacher. He is very funny and lovely, the best History teacher. Father Marian is my Religion teacher. He is a really good person. 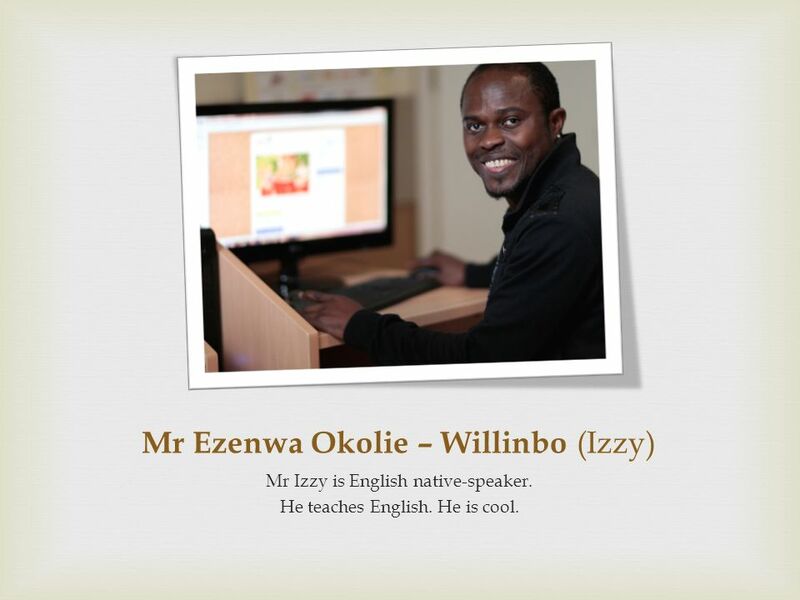 Mr Izzy is English native-speaker. He teaches English. He is cool. Mr Jarek is my swimming teacher. Mrs Ania is our second English teacher, but Mrs Anna doesn’t teach me. She is realy great. Mrs Mirka prepares us for a Secondary School test. A really helpful person. 20 This is my school outside. I love it! 21 Thank you! I think now you know our teachers and my class. Download ppt "My teachers and my community"
Chinese. maths science music art ME PE What are you doing? I am reading English. Who is your English teacher? Mr. White. He teaches well. Where. Hi! My names Agata.Im 12.Im from Poland. I love singing and dancing. I love music. My favourite band is One Direction. I like pop and rock music. Im beautiful. Aliens By Joseph Chan 2A CCC But San Primary School. How CIS affected me ? By Deasia Mosley 8 th What is CIS? CIS means Communities In Schools. “Education is the most priceless inheritance we can give our children What is the greatest treasure that can never be stolen and that is also a priceless. All About The Incredible Emily. My Physical Traits I have brown eyes that sparkle. I have short curly brown hair. I am a little tall for my age. I can. Feb. 14, 2001Badi Chen, St. Paul's High School1 Our School Life Introduction to the project Topics for discussion My School My Teachers and Classes Preparing. The Important Book The Fifth Grade Henry Ford Elementary April 20, 2007. Our School. Olfi ..> Subjects that I like: English, History, Geography and Maths. Subjects that I don‘t like: PE and Art. I like this school, because. MY SCHOOL My school is very nice. We have many lessons, but we have fun, too. Our School Day Our continuous school day runs from 8:00 am. until 14:00 h. and it is differentiated in six class periods, each one with an effective duration. Project of Auschwitz The presentation of the participants from junior high school in Chomranice, Poland.